Mickey’s Very Merry Christmas Party is a ticketed Christmas event held in the Magic Kingdom on select nights in November and December. Christmas is inarguably the most Magical time of year at Walt Disney World, and Mickey’s Very Merry Christmas Party is the most Christmas you can find in Walt Disney World, so the party is one of the flagship events on the Walt Disney World calendar. In this post, we outline everything you need to know in anticipation of the 2019 Mickey’s Very Merry Christmas Party. This post was last updated on April 8 with the 2019 party dates and prices (click to jump to them). First, this guide is based on our experiences as past years, with most details being from the 2018 Mickey’s Very Merry Christmas Party. This guide starts with the basics—how ticketed Disney World events work, dates, prices, buying tickets, and the official event guide map. Then we move onto the specifics of the party. We start with “Holiday Treats,” the free snacks given away at the party. Then we cover character appearances during the party, including a complete roster of the characters and a rough idea of the waits you can expect. After that, we move onto scheduled entertainment. Besides giving you the entire schedule, we briefly discuss the entertainment, which includes an exclusive parade and an exclusive firework show. Speaking of exclusives, next up is exclusive food and merchandise. These are items that are only available at the party! We follow that up with a quick talk about the rides that are open during the party. We finish it up with some talk about Magic Shots, some unlisted elements of the party—such as special park theming and unlisted character appearances—and our closing thoughts on the party. We’ll begin with dates, prices, and some basics about ticketed events. You might be confused about how these ticketed events work. Who needs a ticket? Why should I buy a ticket to this if I have one to the park already? And so on. First, only people who hold tickets to Mickey’s Very Merry Christmas Party are allowed in Magic Kingdom on party days after 7PM. Disney will begin closing the park to people without tickets to the event at 6PM. Tickets can be loaded onto your Magic Band through your My Disney Experience account just like other Walt Disney World tickets. That means that even if you have park hopper tickets, tickets specifically for Magic Kingdom, or even a Walt Disney World annual pass, you won’t be allowed to be in the park after 6PM/7PM without a ticket to Mickey’s Very Merry Christmas Party. 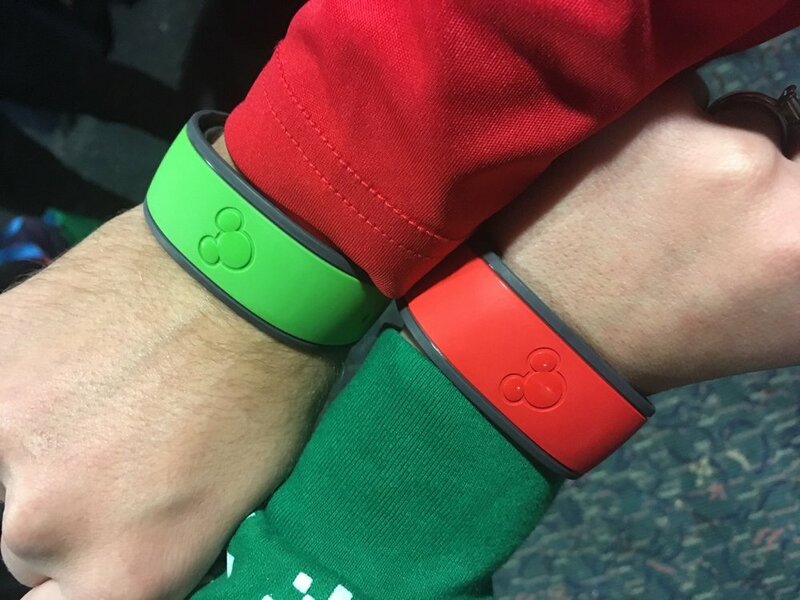 Disney typically monitors these events using wristbands. If you’re already in the park because you had a park ticket for that day and you have a ticket for the special event, you’ll go to a designated wristband location to get your wristband. This bring us to our second big point. Individuals who have tickets only for the party can enter the park as early as 4PM. Disney does not openly state this anywhere, but it is true of both this party and Mickey’s Not-So-Scary Halloween Party. When you enter on your event ticket after 4PM, you’ll immediately be given a wristband. The party ends at midnight. As is typical in Disney parks, shops and the park itself remain open sometime thereafter. We’ll cover more about the party specifically below, but suffice to say you cannot enjoy the party-specific activities, including food and merchandise, without this separate ticket. Mickey’s Very Merry Christmas Party will be held on the following dates in 2019: November 8, 11, 12, 14, 15, 17, 19, 21, 22, and 24; December 1, 3, 5, 6, 8, 10, 12, 13, 15, 17, 19, 20 and 22. Notably the party is not held on Thanksgiving week and it ceases on December 22nd, three days before Christmas. Most dates are Sunday, Tuesday, Thursday, Friday, but the November 11 party is on a Monday. Prices for Mickey’s Very Merry Christmas Party start at $105.44 (including tax) for adults and $100.11 for children. The last two parties, on December 20 and 22, cost the highest, at $148.04 for adults and $142.71 for children. Tickets are $10 more expensive at the gates, except for the last two parties. We buy our tickets (and adovcate buying) through Lauren Quirk at Enchanted Escapes Travel. You can also purchase tickets to the party through Disney World directly or through a trusted discount Disney World ticket seller like Undercover Tourist. So far, we haven’t seen discounts on these tickets, but it’s always worth comparing prices. We loved the holiday treats at Mickey’s Very Merry Christmas Party so much they actually made us pretty sick by the end of the night (in a good way). In 2018, Mickey’s Very Merry Christmas Party offers seven treat stops across the park. The stops don't all have every treat. Instead, you’ll basically find a food-beverage pairing at each site. The sites are all marked with a candy-cane marker. While these stops aren’t always the most organized, even on a sold out party day you’ll be in and out in under five minutes at worst. At most of them, you’'ll just walk up to a counter or Cast Member, grab your free snack, and go. As with the halloween party, you can go through these stops as many times as you’d like, and believe us, you’ll be making multiple trips. You don’t need to plan around the holiday treats. If you’re not waiting on characters, the beginning of the party is a good time to get your snacks. The lines will be a tad longer, but we’re talking 5 minutes versus none. Really, though, you can also just go to the snack stops in between shows and start hoarding (or eating during shows). The cookies are packaged now, which makes it a lot easier to take them home. Mickey’s Very Merry Christmas Party offers unique character greetings you can’t experience any other time of year, even during Christmas outside of the party. Which Characters Are At Mickey’s Very Merry Christmas Party? I’ve bolded the ones that started early on the first night. The characters who started early were the ones that consistently had longer lines, though by the end of the night Moana was down to a five minute wait. For Jack & Sally or The Seven Dwarfs, it’s definitely best to arrive early and hop right in line. The longest line we heard while we were there was Jack & Sally at two hours. The other characters had shorter waits with a bit of ebb and flow. For the most part, they capped at 45 minutes and hovered around 30 minutes. After 10PM’s Holiday Wishes firework show, you’ll see most of these down under 15 minutes. The challenge of meeting characters after 10PM, though, is that several have to disappear for the 11PM parade. You could easily meet any three characters by visiting one before the party starts, one right at the start, and one after 10PM. If you don’t care for any of the one’s starting early, you’ll be able to fit two in right at the start or after 10PM. Before we get to the shows and entertainment of the party, we want to highlight their importance. Mickey’s Very Merry Christmas Party is almost entirely driven by the stage shows, fireworks, and parade. To see every one of them, your schedule is going to be packed! While we describe several “exclusive” offerings in this post, there is one exception—several of these shows are also performed the week of Christmas (after the parties have concluded) during regular park hours. In 2018, these included Mickey’s Once Upon a Christmastime Parade, Mickey’s Most Merriest Celebration, Holiday Wishes, and A Totally Tomorrowland Christmas. During the months of November / December outside Christmas week, though, these offerings are exclusive to the party. Finally, the merchandise, and probably paid snacks (though we’ve never noticed) are only semi-exlcusive. In 2018, once the parties had concluded the remaining merchandise was sold to the public at 25% off. Of course, there’s no guarantee there will be leftover merchandise. Since you (probably) only have one night at the party, you’re going to need to make sure to plan your schedule wisely. Typically, you’re going to have a stretch were you just hop from show to show with maybe enough time for a snack break, but probably not character appearance or rides (you have to do those earlier or later). I’ve bolded our suggested schedule, which includes two viewings of the parade and Mickey’s Most Merriest Celebration. You can obviously cut the second viewing if you have other priorities, like character appearances. As you can see, if you want to make multiple showings of the biggest shows, you aren’t left with much spare time. This castle stage show is back! It held four times a night at 7:40PM, 9:25PM, 10:30PM, and 11:55PM. Try not to wait for the last showing on this one, as you may want to watch it twice. The show is a standard castle show, with Mickey and friends getting together for some Christmas fun. This castle stage show is also back! It is held once a party at 8:15PM. It’s also held during regular park hours, usually at 6:15PM. Since it’s once a party, it is one of the fixed things on your schedule, unless you catch the one during regular park hours. It’s a brief show with little plot, but it culminates in a great lighting of Cinderella Castle. We find this to be the best “kickoff” to your evening’s entertainment, which is partly why we suggest is be your first show of the night. The flagship parade of the party has returned and occurs twice a night at 8:30PM and 11:00PM along the route from Frontierland and down Main Street U.S.A. We’re actually split on the parade, but we both agree that you should watch the 8:30PM parade in case you decide you want to see it twice. This five-time-a-night stage show over in Tomorrowland also returned. It is held at 7:45PM, 8:35PM, 9:25PM, 10:45PM, and 11:35PM. The three-act show features Buzz Lightyear, Stitch, and Mike Wazowski engaging in some creative variations of Christmas songs. We think it’s worth your 15 minutes. Holiday Wishes is the flagship firework show of the party. It is held once a night at 10PM, and is the second “fixed” item on your schedule. Holiday Wishes doesn’t lean too heavily on projections—it’s much more of a classic firework show. That said, there are some cute effects, and the fireworks and soundtrack are great. Club Tinsel is a dance party held in Cosmic Ray's from 7PM to 12AM. Kids can have a chance to dance with some bears and reindeer throughout the night. Storybook Circus Disney Junior Jingle Jam is a dance party in the back of Storybook Circus held from 7PM to 12AM. Kids will get to dance with Timon. The Edge Effect has replaced VoicePlay! This a cappella holiday concert takes four times a night in Tomorrowland, at 8:10PM, 9PM, 10:20PM, and 11:10PM. This one is more of a “swing by and see” show. Snow falls on Main Street U.S.A. as part of the parade and at the time the park closes. The “Dining” section of the map lists even more, and you can read more about the offerings at Disney Food Blog. This year’s Mickey’s Not-So-Scary Halloween party featured three exclusive ride overlays. The Christmas Party, unfortunately, gets no exclusive overlays. 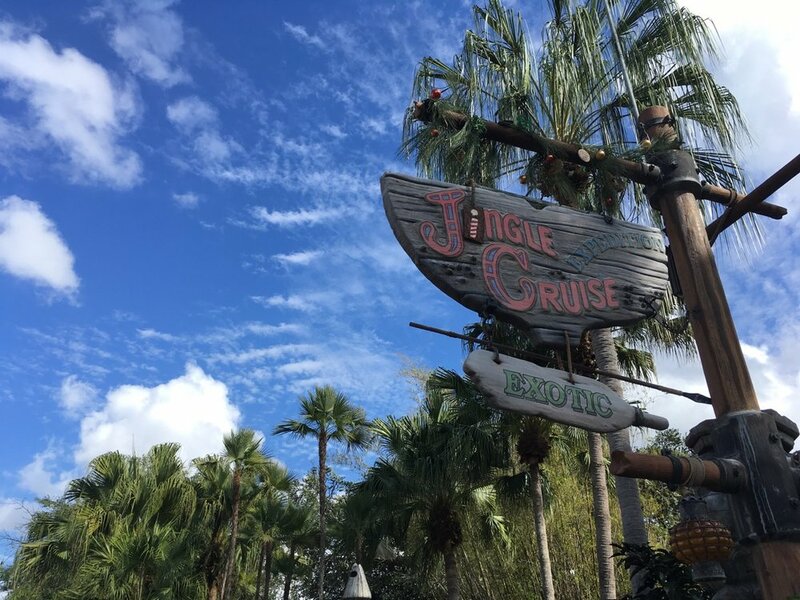 Jingle Cruise, a holiday version of Jungle Cruise operates during the party. That overlay is operational throughout the holiday season, not just at parties. So if you’re going to be at Magic Kingdom any other time during the Christmas season, you might want to plan to ride it then instead of wasting precious party time on it. Beyond that, you can look at the map to see the Magic Kingdom rides expected to be open during the party. Because of the high price and many exclusive things during the party, we really recommend planning to ride any rides! If you’re thinking about rides, look to get on them between 4PM and 8PM or (for shorter lines) after you’ve seen all the entertainment options. Finally, don’t worry about using Walt Disney World FastPass+ during the party, the system is inactive during party hours. There are four “Magic Shot” locations during the party where you can get special PhotoPass Magic Shots unique to the party. These are indicated on the map. Unfortunately, you’ll have to purchase Memory Maker or otherwise have access (like though an annual pass) to enjoy the photos. We haven’t yet had a chance to grab any of these Magic Shots. The Disney Parks Blog previewed them, though. Besides everything that is promoted on the website, parks blog, or guide map, there are plenty of smaller touches throughout the park. Over in Frontierland, you’ll find the Country Bears and some performers singing some Christmas tunes. The entrance to Tomorrowland has some nice projections. Here’s an overexposed look at the snow on Main Street, U.S.A.
Pirates of the Caribbean gets an interesting holiday projection. And Main Street, U.S.A. is lit with a variety of colors that change as Christmas songs play. We were pleasantly surprised that Mickey’s Very Merry Christmas Party exceeded our high expectations. Coming off the Halloween party, we thought we were pretty calibrated. It turns out, though, that the Christmas party is so much more jam packed. We highly recommend the party for anyone with a love of Disney or Christmas. We’ll actually be returning later this season, and hopefully we’ll add to our great experiences!